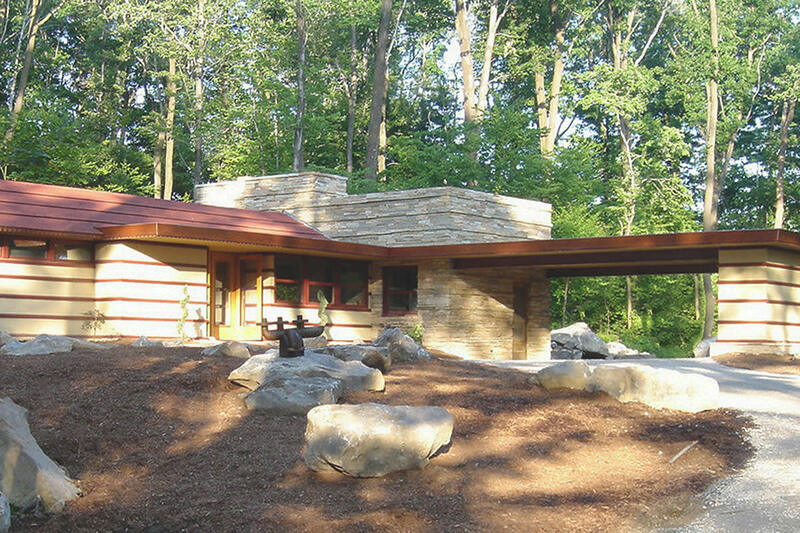 In honor of the 150th birthday of American architect Frank Lloyd Wright (June 8, 1867-April 9, 1959), I spent a weekend in May chasing down his work. It was easy with three houses by the master and three buildings by his apprentices less than 250 miles east of Cleveland and open to the public. The trip to an area just outside Pittsburgh requires a little logistical planning, but, with the right timing, visitors may score a bed in a Wright original or a luxury suite designed by his apprentice David Merritt. That philosophy means choosing local, natural materials and creating space that facilitates life in harmony with surroundings. Of the 1,000 buildings Wright designed, his greatest example of organic architecture is Fallingwater, a country retreat built in the Laurel Highlands for department store magnates Edgar and Liliane Kaufmann in the late 1930s.